Compass Landing Homes: This beautiful Winward floor plan, a two story Coastal Elevation and BRAND NEW single family home 3,747 square feet, is a home for people who are not looking to downsize, but rather looking to right-size. The Windward has 4 bedrooms plus loft and 4-1/2 baths, a 3 car garage, a beautifully equipped chef’s kitchen with 42 inch cabinets, stainless steel appliances, granite countertops, backsplash; a sliding glass door hideaway and large screened lanai with oversized yard, and plenty of room for a pool; a formal dining room, an owner’s suite with tray ceilings, a huge walk-in closet, an owner’s bath with dual sinks, corian counter tops, walk-in shower and separate tub. Compass Landing is a private and secluded gated community featuring DEEP LOTS from 50ft-60ft. wide and 130ft-180ft. long with low association fees! Located in North Naples and minutes to I-75, Mercato, Waterside Shops, Gulf Beaches and zoned with “A” rated Collier County public schools. Residents enjoy a 2,600-sqft amenity center appointed with resort-style pool, clubhouse, tot lot and fitness center. *Note: Photos are not of the actual home, but of a model with similar floor plan. Compass Landing Homes: Beautiful BRAND NEW one-story single-family home, just under 3,500 square feet and with an upgraded Craftsman Elevation. The moment you enter this Trimaran Model, you will appreciate the quality of workmanship. Featuring an open floor plan, with a great room, 4 bedrooms, 3-1/2 bath, flex room and 3 car garage. Upgrades include a Chef’s kitchen with quartz counters, backsplash, 42 inch cabinets, and stainless steel appliances; plank tile throughout the living area, tray ceilings in the foyer and master bedroom, 5¼ inch baseboards throughout the entire home; an owner’s suite with a walk-in closet; owner’s bath with dual sinks, quartz counter tops, walk-in shower; large lanai with a beautiful preserve view and northern exposure. Compass Landing is a private and secluded gated community featuring DEEP LOTS from 50ft-60ft. wide and 130ft-180ft. long with low association fees! Located in North Naples and minutes to I-75, shopping, Beaches and zoned with “A” rated Collier County public schools. Residents enjoy a 2,600-sqft amenity center appointed with resort-style pool, clubhouse, tot lot and fitness center. Compass Landing Homes: Beautiful BRAND NEW one-story single-family home, just under 3,500 square feet and with a West Indies Elevation. The moment you enter this Trimaran Model, you will appreciate the quality of workmanship. Featuring an open floor plan, with a great room with a sliding glass door hide away, 4 bedrooms, 3-1/2 bath, flex room and 3 car garage. Upgrades include a Chef’s kitchen with quartz counters, backsplash, 42 inch cabinets, and stainless steel appliances; plank tile throughout the living area, 5¼ inch baseboards throughout the entire home; an owner’s suite with a walk-in closet; owner’s bath with dual sinks, granite counter tops, walk-in shower; large lanai with a beautiful preserve view and northern exposure. Compass Landing is a private and secluded gated community featuring DEEP LOTS from 50ft-60ft. wide and 130ft-180ft. long with low association fees! Located in North Naples and minutes to I-75, shopping, Beaches and zoned with “A” rated Collier County public schools. Residents enjoy a 2,600-sqft amenity center appointed with resort-style pool, clubhouse, tot lot and fitness center. *Note: Photos are not of the actual home, but of a model with similar floor plan. Compass Landing Homes: Beautiful BRAND NEW one-story single-family home, just under 2,700 square feet and with an upgraded Craftsman Elevation. The moment you enter this Mariner Model, you will appreciate the quality of workmanship. Featuring an open floor plan, with a great room, 4 bedrooms, 3 bath, flex room and 3 car-garage. Upgrades include a Chef’s kitchen with stainless steel KitchenAid appliances, 42 inch cabinets, tray ceilings in the master bedroom, 5¼ inch baseboards throughout the entire home; an owner’s suite with a walk-in closet; walk-in shower; large screened lanai with an oversized lot. Compass Landing is a private and secluded gated community featuring DEEP LOTS from 50ft-60ft. wide and 130ft-180ft. long with low association fees! Located in North Naples and minutes to I-75, shopping, Beaches and zoned with “A” rated Collier County public schools. Residents enjoy a 2,600-sqft amenity center appointed with resort-style pool, clubhouse, tot lot and fitness center. Compass Landing Homes: Very Unique and the only two story 4 bedroom plus a flex room, 3 bath Craftsman Alee home located in this community. Enjoy your own outdoor swimming pool built in 2018 while overlooking the beautiful lake. Tray ceiling in the foyer and high ceilings throughout the home. 5-1/2 inch baseboards, plantation shutters throughout and decorative staircase railings are just an addition to the exceptional array of upgrades. The kitchen has 42 inch Tahoe Cherry Spice cabinets, butler's pantry, upgraded wall tiles, Lapidus granite countertops and stainless steel appliances. Beautiful wood plank tiles throughout the dining, great room, kitchen, flex room and foyer. Master bathroom has dual sinks, walk in shower and tub and beautiful oil rubbed bronze fixtures. Huge upstairs bonus room and loft with a full bathroom. Beautiful landscaped home with a two car garage, brick pavers in the walkway, driveway and lanai. Gated Community features Clubhouse, Community Pool/spa, Hobby area and play area and fitness room. Close to everything: Gulf beaches, shopping, restaurants, etc. Compass Landing Homes: Beautiful BRAND NEW one-story single-family home, just under 2,700 sf and with an upgraded Coastal Elevation. The moment you enter this Mariner Model, you will appreciate the quality of workmanship. Featuring an open floor plan; a great room with a sliding glass door hide away; 4 bedrooms, 3 bath, flex room and 3 car-garage. Upgrades is a Chef’s kitchen with stainless steel KitchenAid appliances, 42 inch cabinets, quartz counters and backsplash, 5¼ inch baseboards throughout the entire home; owner’s suite with a walk-in closet; walk-in shower; travertine floors in the master bath and quartz countertops in all three bathrooms. Plank tiles in the foyer, flex room, great room, laundry area and kitchen. Large screened lanai with an oversized lot. Compass Landing is a private and gated community featuring DEEP LOTS from 50-60ft wide and 130-180ft long with low association fees! Located in North Naples and close to I-75, shopping, Beaches and zoned with “A” rated Collier County public schools. Residents enjoy a 2,600-sqft amenity center with resort-style pool, clubhouse, tot lot and fitness center. *Note: Photos are not of the actual home, but of a model with similar floor plan. Compass Landing Homes: Living is easy in this generously spacious BRAND NEW single family home. This much desired single story Banyan model features an open floor plan that encompasses 3 spacious bedrooms, 2 -1/2 baths, a study, and a 2 car garage. The expansive living room opens up to a spacious screened lanai, oversized yard and plenty of room for a pool; a stylish kitchen with 42 inch cabinets, beautiful backsplash, stainless steel appliances, Zodiaq countertops, and a butler’s pantry; plank tiles in the living area, spacious owner’s suite with a walk in closet; owner’s bath with dual sinks, Zodiaq counter tops, walk-in shower. Every detail was carefully selected and quality crafted by a designer. Compass Landing is a private and secluded gated community featuring DEEP LOTS from 50ft.-60ft. wide and 130ft.-180ft. long with low association fees! Located in North Naples and minutes to I-75, Mercato, Waterside Shops, Gulf Beaches and zoned with “A” rated Collier County public schools. Residents enjoy a 2,600-sqft amenity center appointed with resort-style pool, clubhouse, tot lot and fitness center. Compass Landing Homes: BRAND NEW construction, a Capstan model WITH West Indies elevation is a perfect single-family home. Incomparable living begins with this 3 bedroom, plus flex room, 2 full and 1 half baths, and 2 car garage. Home features a large open great room; formal dining room; Beautiful kitchen with 42-inch cabinets, and stainless steel appliances. Upgrades include: tray ceilings at the foyer, 5¼ inch baseboards throughout the home. Owner’s suite with a walk-in closet, owner's bath with dual sinks, walk-in shower; screened lanai. Compass Landing is a private and secluded gated community featuring DEEP LOTS from 50ft-60ft wide and 130ft-180ft long with low association fees! 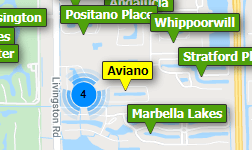 Located in North Naples and minutes to I-75, Mercato, beaches and zoned with “A” rated Collier County public schools. Enjoy a 2,600sf amenity center, resort-style pool, clubhouse, tot lot and fitness center. Compass Landing Homes: This popular Admiral West Indies floor plan gives you an inviting feeling from the moment you walk in. This desired Single story home features an open floor plan that encompasses 3 spacious bedrooms, 2 baths, a den, and a 2 car garage. 10’ ceiling draws you in to the great room with a Sliding glass door Hide-away while the oversized kitchen with a center island lends itself to casual entertaining. Kitchen is equipped with 42 inch cabinets, stainless steel appliances, Granite countertops and backsplash. Plank tile throughout the great room, window blinds and 5¼ inch baseboards throughout the home; an owner’s suite with a walk-in closet; owner’s bath with dual sinks, Granite counter tops and walk-in shower. A large screened lanai, oversized yard and room for a pool. Compass Landing is a private and secluded gated community with DEEP LOTS from 50-60ft wide and 130-180ft long and low association fees! Located in Naples and close to I-75, Mercato, Shops, beaches and zoned with “A” rated Collier County public schools. Enjoy a 2,600-sqft amenity center, resort-style pool, clubhouse, tot lot and fitness ctr. Compass Landing Homes: The always popular Admiral floor plan gives you an open, inviting feeling from the moment you walk in. This Lake view desired Single story home features an open floor plan that encompasses 3 spacious bedrooms, 2 baths, a flex room, and a 2 car garage. 10’ ceiling draws you in to the great room while the oversized kitchen with a large center island lends itself to casual entertaining. Kitchen is equipped with 42 inch cabinets, stainless steel appliances and Granite countertops. Tiles throughout the great room, tray ceilings in the foyer, windows, blinds and 5¼ inch baseboards throughout the entire home; an owner’s suite with a walk-in closet; owner’s bath with dual sinks, Granite counter tops and walk-in shower. Oversized yard and plenty of room for a pool; upgraded lighting throughout. Compass Landing is a private and secluded gated community featuring DEEP LOTS from 50ft-60ft wide and 130ft-180ft long with low association fees! Located in North Naples and minutes to I-75, Mercato, Waterside Shops, beaches and zoned with “A” rated Collier County public schools. Enjoy a 2,600-sqft amenity center, resort-style pool, clubhouse, tot lot and fitness ctr. Compass Landing Homes: The very popular Admiral floor plan gives you an open, inviting feeling from the moment you walk in. This Preserve view desired Single story home features an open floor plan that encompasses 3 spacious bedrooms, 2 baths, a flex room, and a 2 car garage. 10’ ceiling draws you in to the great room with hide away sliding glass doors while the oversized kitchen with a large center island lends itself to casual entertaining. Kitchen is equipped with 42 inch cabinets, stainless steel appliances, Granite countertops and backsplash. Plank tiles throughout the great room, flex room, kitchen and laundry. Wood blinds and 5¼ inch baseboards throughout the entire home; an owner’s suite with a walk-in closet; owner’s bath with dual sinks, Granite counter tops and walk-in shower. A screened in lanai, Oversized yard and plenty of room for a pool. Compass Landing is a private and gated community featuring DEEP LOTS from 50-60ft wide and 130-180ft long with low association fees! Located in North Naples and minutes to I-75, Mercato, Waterside Shops, beaches and zoned with “A” rated Collier County public schools. Enjoy a 2,600-sqft amenity center, resort-style pool, clubhouse, tot lot and fitness ctr.